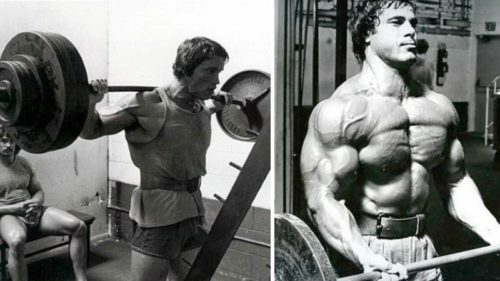 Whenever a new approach to lifting is revealed, everyone seems eager to see if it’ll work or if it’s just another failed experiment. Luckily, today we’re looking at a system that has been shown to be effective, since it’s built on knowledge and previous experience – the DROP 5 system. It’s based on micro-periodization which means that every week, you’d increase the weight and you’d drop the reps just a bit, making the most of every set to pack on more muscle on your frame. In the first week, you will encounter moderate weight and a high number of reps, but by the third week, there will be a significant reduction in reps while your weight is upped. Sounds like a classic routine, right? Nope. For this system, we are going to take four exercises – the squat, deadlift, bench press and the military press. Each of them will be performed for as long as you can handle it, but not to muscle failure. Instead, stop doing reps when your form begins to ruin or if you think one more rep will be too much to handle. The DROP 5 system emphasizes progression, which means that every single rep will be made harder from week to week. Your average lifted weight will go up, along with your strength and muscle mass. You do every single set with as many reps as you can until you start slipping. Let’s say that during the first week, you didn’t lift 10 or more reps on your 225lbs set. Also, in the second week, you didn’t do 8 or more reps on the 240lbs set, so there will be no changes there either. However, on the third set, let’s say you were able to lift 5 or more reps on your 255lbs set, which means that this training day should be strengthened for the sixth week, when it’s supposed to be trained next. For the next cycle, you will start at 225lbs for week 4, 240lbs for week 5 and instead of 255lbs, you will start with 260lbs for week 6. 4 sets of leg presses with 15-20 reps each. 4 sets of seated calf raises with 12-20 reps each. 4 sets of pull ups or inverted rows with 8-12 reps each. 4 sets of close grip bench presses with 8-12 reps each. 4 sets of leg press calf raises with 15-20 reps each. 4 sets of cable crunches with 15-20 reps each. 4 sets of incline dumbbell bench presses with 10-12 reps each. 4 sets of skullcrushers or cable triceps extensions with 10-15 reps each. There is no reason to overload your body. Every 4th week you should automatically deload, but if you’re not feeling too bad, keep going. If, however, you are feeling exhausted before the three weeks are done, take an off week after your next 3 week cycle. Also, you will need to take a light week after your 9th to 12th week to boost your morale, heal your body and have some fun. You’ll need this week. You can also swap exercises as long as they’re interchangeable – barbell and dumbbell rows, standing and seated curls and so on. Also, you can put in some traps, forearm training or practically anything else, but don’t overdo it. This is a really well rounded program that doesn’t need a lot of improvements or tweaks, just stick with it and soon enough you will see results.